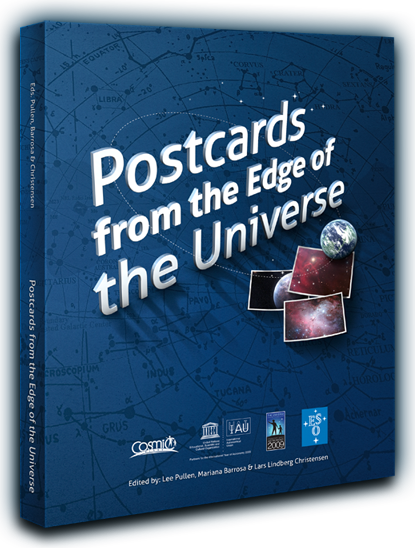 From sunspots to black holes, planets around other stars, supernovae and dark matter, Postcards from the Edge of the Universe unveils the mysteries of today’s research, looking at cutting-edge astronomy from around the world. 24 frontline astronomers from all corners of the globe explain their science in accessible language in articles edited by veteran communicators Lee Pullen, Mariana Barrosa and Lars Lindberg Christensen. This book is based on the science carried out by a hand-picked selection of the best bloggers from the Cosmic Diary ( www.cosmicdiary.org ), one of the 12 Cornerstone projects of the International Year of Astronomy 2009. The contributions have been compiled into an edited anthology that gives a unique snapshot of contemporary astronomy. The four-page popular-science articles all have a personal flavour, as each contributor has selected their own favourite astronomical topic, giving the reader a personal insight into work on the frontline of astronomy.